By the end of our two-hour dinner at the all-you-can-eat Sushi restaurant, Makrina Morozowski, 26, surpassed all expectations of “athlete.” But, “rock star,” or as her licence plate says, ROXSTR, would also be an accurate description. From repelling, twice, down the side of a Calgary high rise as an ambassador for Easter Seals, to her notable sense of humour, to her commitment to eating three more pieces of sushi on a full stomach, just to save her new friend from having to pay an extra four dollars, Morozowski has every trait of a true champion. “If there’s a piece of inspiration, I hope you use it,” says Morozowski. The first official activity Morozowski tried was skiing when she was three. Her father, Doug, taught her – even before she received the diagnosis. After many visits to doctors searching for answers as to why her physical development was delayed and why she ran with a gait, a neurologist held up her four-year-old body and told her parents their daughter has cerebral palsy. That diagnosis was one she may not remember receiving, but one she will never be able to forget. Although devastating for any parent to hear, it also opened doors. “I think as a parent you want to protect them, but we didn’t stop her from doing anything,” explained Debbie Morozowski, who said at times it was hard watching her try. She recalls her daughter getting an “A” in dance class because her teacher said she always gives 110 per cent. Instead of being the one who struggled physically, the diagnosis opened doors for her to come out and play and belong as an athlete with people who have similar abilities. I always find myself informing people of the difference between Olympics, Paralympics and Special Olympics,” explains Morozowski, who plays parasports. Born and raised in Calgary was a blessing because of the facilities and programs. Before she underwent surgery on her legs at age ten and again at twelve, Morozowski could still run, something she speculates about to this day, and thinks about what it would feel like to run again. She walks with crutches, has a wheelchair for basketball, but is able to get around at home without assistance. Opportunity arrived in various forms. One day, post-surgery, she was riding a bus home and a classmate invited her to come out and try sledge hockey. This was the first parasport she played. Morozowski continued to ski on outriggers and competed with the Alberta provincial team. Her coach tried to convince her to continue when she went away to postsecondary school in Lethbridge, where she obtained a bachelor of arts in psychology, she decided not to because of the amount of travelling. At first she wondered if saying no was such a good idea because there was not the opportunity in Lethbridge at the time for parasports like there was in Calgary. One day she saw a notice for a sledge hockey intro-day. Because she was experienced she was able to help facilitate activities, sharing knowledge of the sport. When the program ended what remained was the equipment and, even more importantly, the people who wanted to play. A few years in to her five years in Lethbridge, she created an official team. Morozowski would swim in the mornings and play sledge hockey in the afternoon. Then came the invitation to join basketball. Not only did she sleep really well from all of the activity, she also met her friend Niek Theelen. “Makrina and I both worked hard to get our friends in adaptive sports at the University of Lethbridge to come out and give sledge hockey a try,” says Theelen, who also has cerebral palsy. In the summer of 2013 Morozowski was at a concert when Canadian Paralympic gold medalist in wheelchair basketball, Kendra Ohama, introduced herself and invited Morozowski to come out. Morozowski joined the Calgary Rollers, where she still plays. Morozowski says her most memorable winning was in 2015 when she played basketball with Team Alberta. “Coming home with a bronze medal, with everyone around you, with the best of the best in the province,” she recalls with a smile. One loss that stands out for her was during a ski competition. She skied well, but was disqualified for going around the wrong side of the gate. For her, learning how to win and lose respectfully is always the number one lesson. Number two is realizing what went well and how to continue, or what went wrong and how to improve. Morozowski says there is a lot of mutual mentoring in the sports she plays. In adaptive sports there is a wide range of ages and people tend to play much longer. Morozowski says there are three main benefits of belonging and playing parasports: the biological, social and psychological. She appreciates the increase of awareness, such as the Canadian Tire commercial where father and son go out to play sledge hockey. She was also excited that she was able to live stream the Paralympic games this year. She spoke of the Humboldt Broncos tragedy where one of the survivors suffered a spinal cord injury. Sledge hockey Paralympian, Kevin Rempel, put out on his patio 15 sledge hockey sticks with a tearful message. “I just want to let you boys know that, whenever you’re ready, let me know,” Rempel said to CBC news Toronto on April 12. “If that (accident) would’ve happened 10 or 15 years ago would people even know about it?” questions Morozowski. For the past two-and-a-half years Morozowski has been training at Bedrock CrossFit. She says the “transferable effects” she has noticed with CrossFit have been profound. She started her workouts in her basketball chair, but after the first year she “threw that aside.” She can now lift her small cousin in the air and ski without falling. She and her family still ski and kayak together. She enjoys this time with her sister, Camille, and her parents. Being active has been a large part of the family’s lives and is reflected in her own. She values that her parents gave her lots of room to grow and learn, providing support when needed. 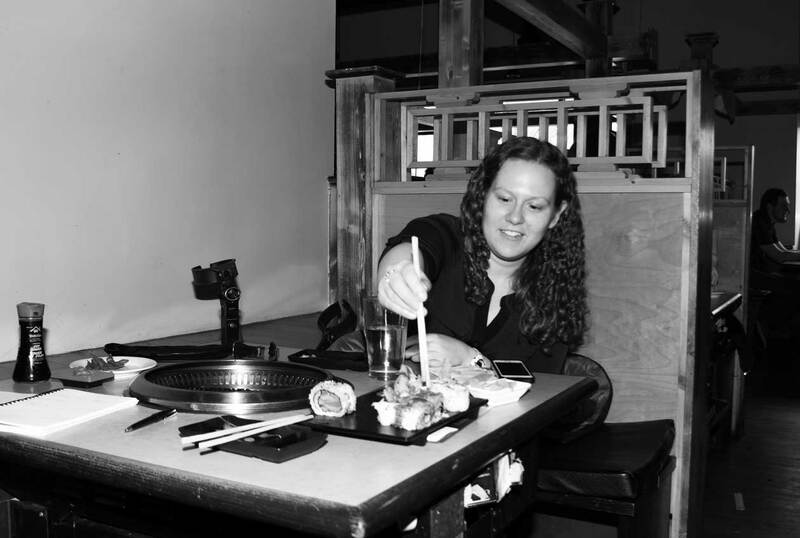 “I’m not much of a barbequer,” her brown eyes sparkle as she flips the meat on the hot burner at Sushi BBQ. And yet, she can and she does. Even as Makrina Morozowski says she is not much of a “barbequer,” she proves – as she does – that she is. Photo by Janaia Hutzal April 15, 2018.